Book early to avoid the rush. 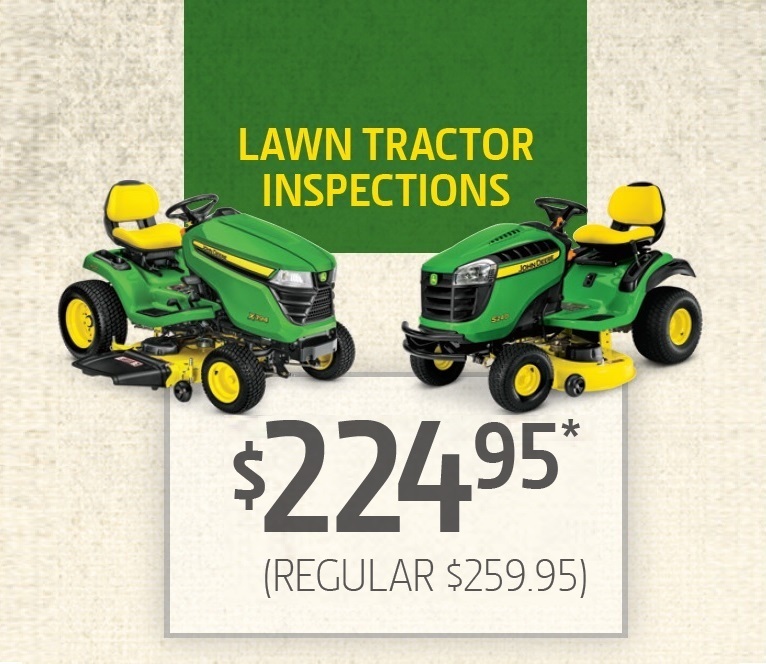 Your riding lawn equipment is a big investment, and so is your land. 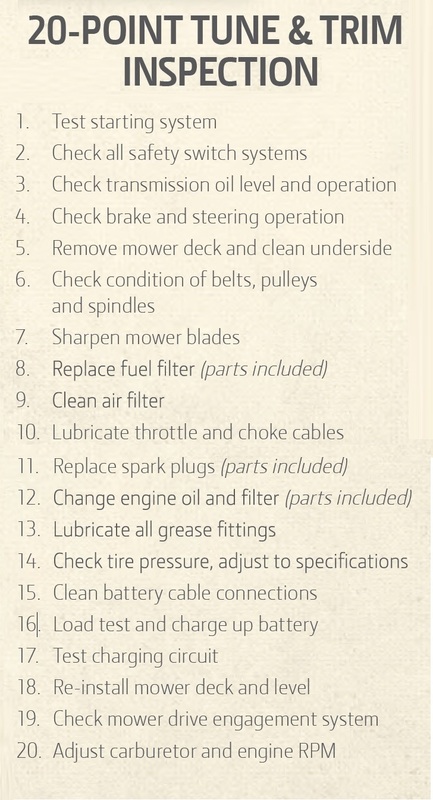 At Huron Tractor, we'll help you protect your investment and keep your machine running great with our Spring Tune & Trim Inspections. 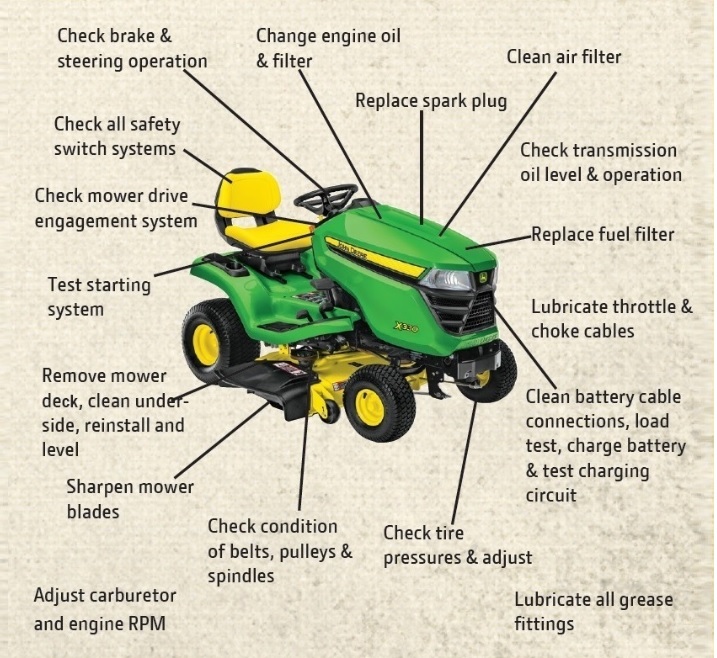 For 1 & 2 cylinder engine lawn tractors such as John Deere S240, 100, X300, X500-Series Lawn Tractors, service includes oil change, blade sharpening, fuel filter, spark plug, deck leveling & more. 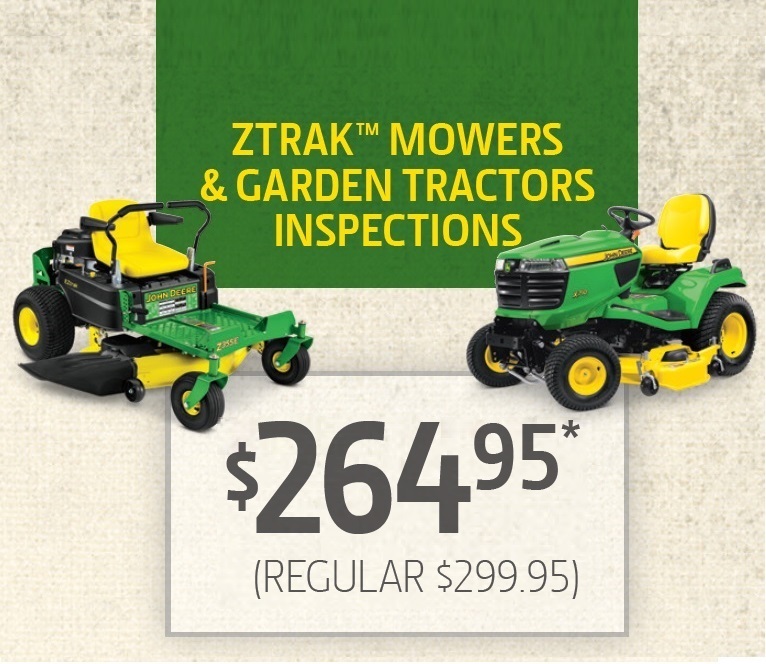 For zero-turn mowers & 3 cylinder engine garden tractors such as John Deere X700-Series Garden Tractors, service includes oil change, blade sharpening, fuel filter, spark plug, deck leveling & more. *Give us a call for pricing on other makes and models, removing and installing attachments, or customized packages just for you. Upon completion of the inspection, you will be called with an estimate for any additional parts or repairs required to complete your machine tune-up. Labour and regular inspection parts included. Additional parts may be extra. All work to be completed in shop. Taxes, pickup and delivery charges are not included. Attachments and implements are sold separately. Why a Service Inspection is the right choice. •	Protect your equipment investment by keeping it in good running condition. •	Ensure your equipment performs best when you need it most. •	Minimize the risk of downtime or costly repairs. •	Maximize your resale value.